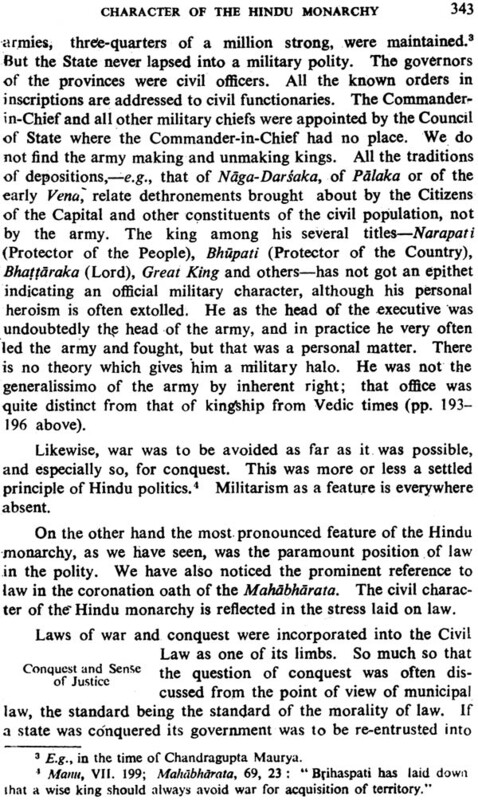 'Hindu Polity,' in two volumes (Parts) the first on Vedic Assemblies and Republics, the second on Monarchy and Imperial Systems-is a sketch of the constitutional life of the Hindus. Subject and Difficulty: The subject is great but its treatment has to be modest. The works of purva-suris had long been hidden; the path opened by them had long been lost. It had to be researched. In 1911-13 a probable line was laid to dig and discover the Ancients' highway in the field of Polity. In these pages that line has been deepened and widened. And the way of the Fathers is in sight. 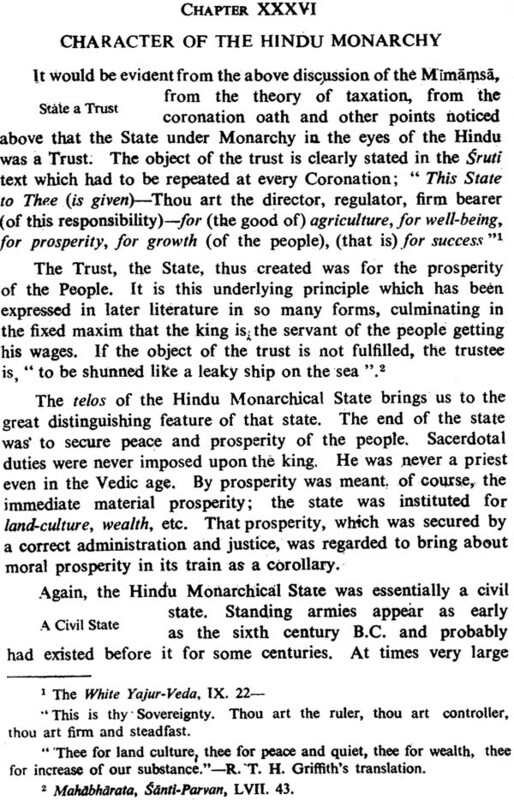 Pioneer Work: The author made a special study to find out what constitutional progress, if any, Ancient Indians had achieved. 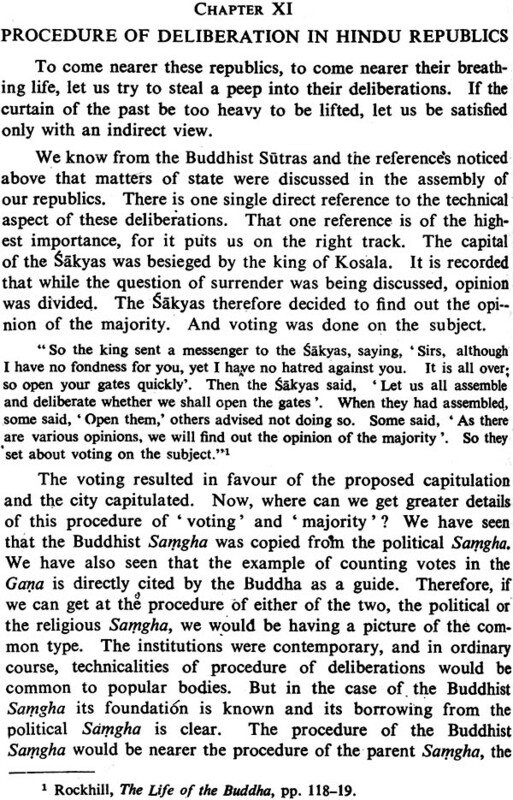 In 1911 and 1912 some results of the study were published in the legal journal the Calcutta Weekly Notes and the Calcutta monthly the Modern Review. 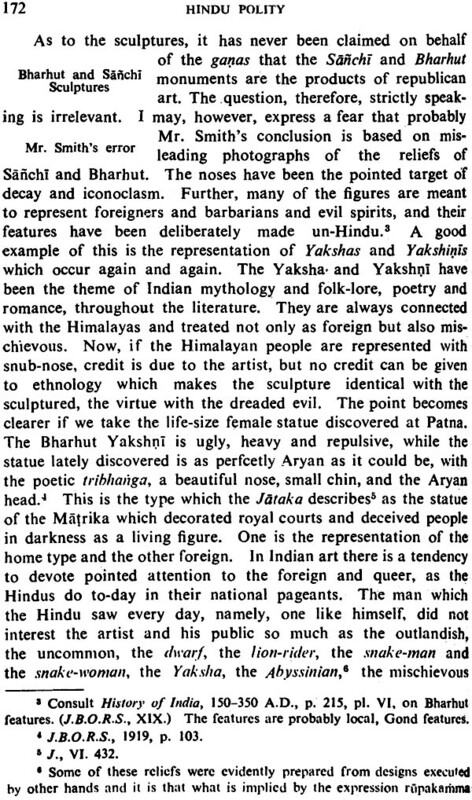 A connected paper was read to the Hindi Literary Conference in 1912 and its translation published in the Modern Review, 1913, under the title, An Introduction to Hindu Polity'. Before the publication of the Introduction there had been no work in any modern language on the subject. The Introduction fulfilled its purpose. Today the subject finds place in University teaching. And the author has had the satisfaction of seeing his results quoted and reiterated, with or without acknowledgment, almost every year; the subject has become popular; the truth has been recognized, accepted and adopted: it has rightly ceased to be his. 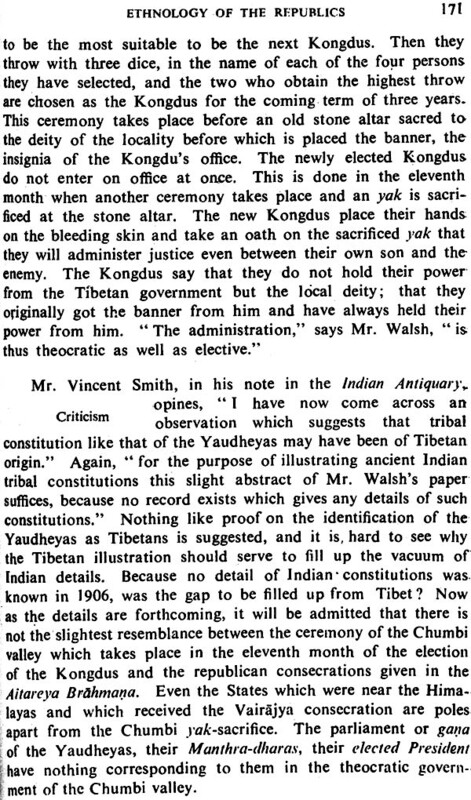 Preparation of the Present Work: Vincent Smith suggested to the author to treat the subject of Hindu republics in detail, and several friends insisted on having the Introduction in book-form. About the same time, Sir Ashutosh Mukherji, President of the Council of Post-Graduate Teaching, Calcutta University, asked him to prepare a curriculum of Ancient Indian History. Need at that time was badly felt for a somewhat comprehensive book on ancient Hindu Polity. The author towards the close of 1917, undertook to revise the Introduction with a view both to carry out the suggestion of Dr. Smith and to supply the want. The present work was the outcome. In April. 1918, the revision was complete and the manuscript ready. The book was made over to Sir Ashutosh Mukherji who kindly took upon himself the publication of the work, placing it on the University syllabus. Why delay in Publication: When a few chapters had been in type, the author was informed that scientific plagiarism was at work. Then the manuscript was stolen from Sir Ashutosh, no other belonging out the group from which the box of manuscript was missing, was touched by the critical though secret admirer. Sir Ashutosh informed the police, with the result that a professor who claimed to have recovered the manuscript made it over to Sir Ashutosh. After three day's confinement the book obtained liberation. Having no other copy of the book, the Calcutta University Press being too slow, and the desire to publish "original researches" in certain quarters in Calcutta being great, the author brought back the manuscript to Patna. Engagement was then concluded to print the book at Allahabad. In the meantime the book was cited by Sir Sankaran Nair from the manuscript in his Note to the Government of India's First Despatch on Constitutional Reforms (dated 5th March, 1919), and chapters were printed in the Modern Review (Feb., 1920). When the whole of Part I was in type the English Section of the Press at Allahabad was sold away and the book once more came back home. Until this autumn, owing to the difficulties of getting a suitable press from a 'mofussil' town, and owing to professional duties, no fresh arrangement could be made for the publication of the work. The Present Work: The lines laid down in the Introduction (1913) have been closely followed in the present work. Except the chapter on Paura-Janapada there has been no addition to those broad lines. The whole work otherwise is only a commentary on the Introduction. 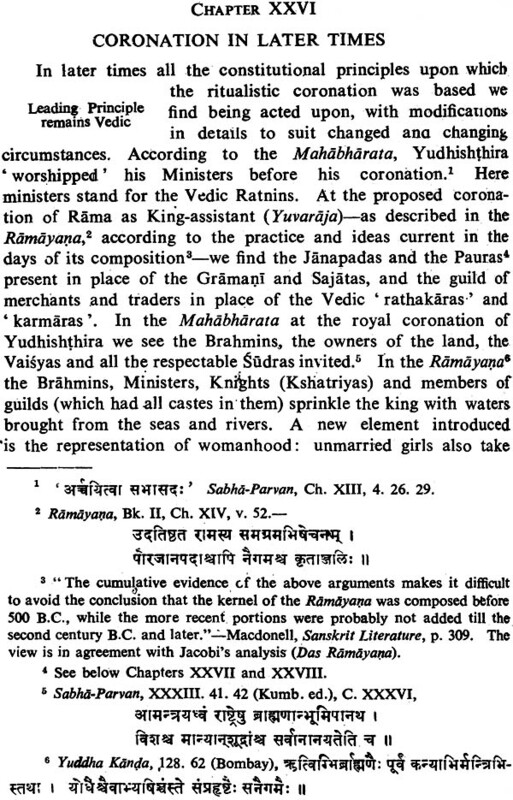 The books is presented in the form and substance just as it was completed in April, 1918, but for the amalgamation of the matter published by the author in the Modern Review in April, 1920, on Paura Janapada, and the addition of one passage (27) on a datum from the Abhidhana Rajendra (1919), of the last line of the footnote at p. 31, and of Appendices C and D. The date of the Kautiliya (Artha-Sastra) has been retained as originally given, although Dr. Jolly has recently revived the controversy through his edition of the Artha-Sastra. On account of the importance of the subject the present writer has re-considered is here. He is unable to agree with Dr. Jolly's conclusion. The author's thanks are due to his kind friends Dr. A. Banerji-Sastri and Dr. Suniti K. Chatterji for reading the proofs and valuable suggestions, to Mr. H. Chakladar and Mr. Bata K. Ghosh for verifying references, and Dr. Kalidas Nag and Prof. Arun Sen for doing the index. His friends the late Mr. H. Panday had helped him in the preparation for the Ms. Scope of the book; Sources; Technical Literature; Its early date; Terms for Technical Literature; The book on Politics in the Mahabharata: 400 B.C.-500 A.C.; Works of the fourth and fifth Centuries A.C.; Compilations by Hindu Lawyers of fourteenth to eighteenth Centuries A.C.; Politics in the Puranas, sixth and seventh Centuries A.C.; Politics in the books of Dharma (Law) 400 B.C.-500 A.C.: Works of early Middle Ages; Politico-ethical and politico-religious book; Addendum I on the growth of Political Science Literature after the third Century A.D.
Samiti represented the whole People; Its functions; The King and Samiti; Deliberations; Non-political business of the Samiti; Samiti an institution of developed society; President of the Samiti; Constitution of the Samiti; Historical career of the Samiti. Sabha a distinguished popular body; Its resolutions; Composition of the Sabha; Judicial Function of the Sabha; Sabha a later Rig-vedic Institution; Vidatha and Sena; Corporate tendency of post-Vedic life. 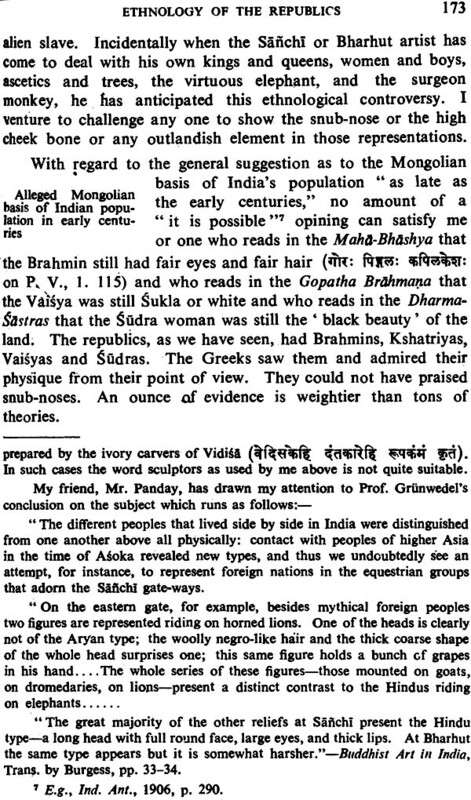 Republics generally post-Vedic institutions; Ancient terms for Hindu republics; Significance of 'Gana'; Samgha; Controversy on Gana in England; Panini on Gana; The Jatakas on Gana; The Mahabharata on Gana; Hindu Law and Amara-kosa on Gana; The Avadanasataka on Gana; Jaina definition; Conclusion on Gana. 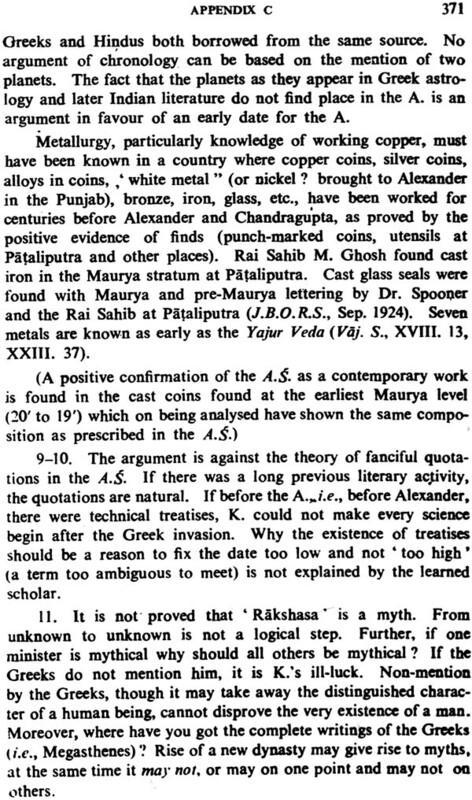 Panini on Samgha; Castes in a Samgha; Katyayana on Samgha; Ayudhajivin Samghas named in Panini; Interpretation of Ayudhajivin'; Description of Greek Writers; Identification of the Vahika land; Other republics in Panini; The Andhaka-Vrishni Samgha; Constitutional Significance of 'Rajanya'; Federal Constitution of the Andhaka-Vrishnis; Vrishni coins and Rajanya coins; State-arms of the republics; Political Nikayas: A species of Samgha. 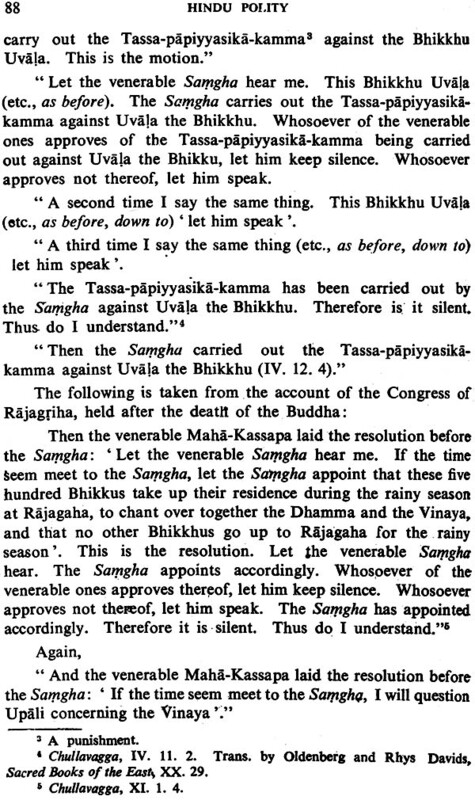 Buddhist Samgha borrowed from Political Samgha; Recorded republics; Their administrative procedure; Lichchhavi constitution; Lichchhavi safeguards for liberty of the citizen; Federal Council of the Lichchhavis and the Mallas; Its Composition. 'King'-consul Republics; Changes from Monarchy to Republic; Mallas, Kurus, Kukuras; Nation-in-arms Republics; Kshudrakas and Malavas; Surashtras; Kshatriyas; and Srenis. 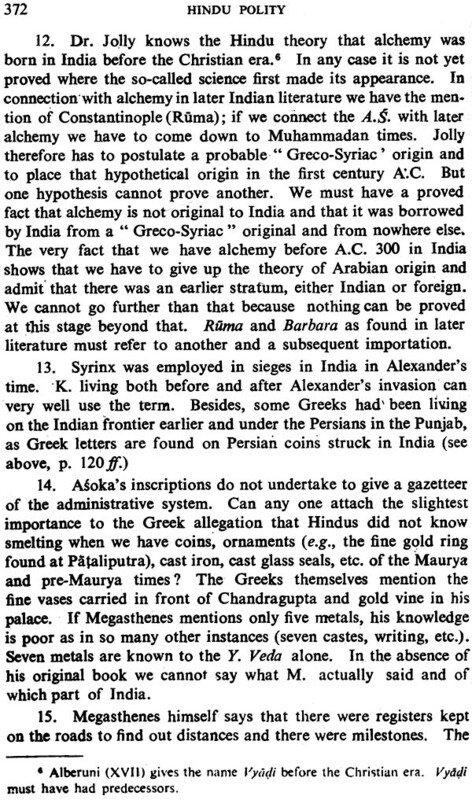 Megasthenes' Two Divisions of the Country-Monarchical and Republican; Kathaians; Unnamed Republics; Adrestai; Saubhuti (or Subhuta); A great Republic on the Beas; Kshudrakas and Malavas, and Sibis; Apisali, Panini and Patanjali on the above; Greek Writers on the above; Agra-Srenis; Ambashthas; Kshatriyas; Ossadioi; Musicani; Brachmanoi; Patala; States ambiguously described. Democracy; Elected 'King' President; Second Chamber; Executive authority; Aristocratic democracy; Large Parliaments; Hindu term for aristocratic constitution; Culture in these republics; Influence of Polity on Physique. Technical Constitutions; Bhaujya Constitution; Svarajya Constitution; Vairajya Constitution; The Madras and their Capital; Rashtrika Constitution; Pettanika; Dvairajya Constitution; The Non-ruler State; Ugra and Rajanya forms of government; Sacrament of rulership essential in every constitution. 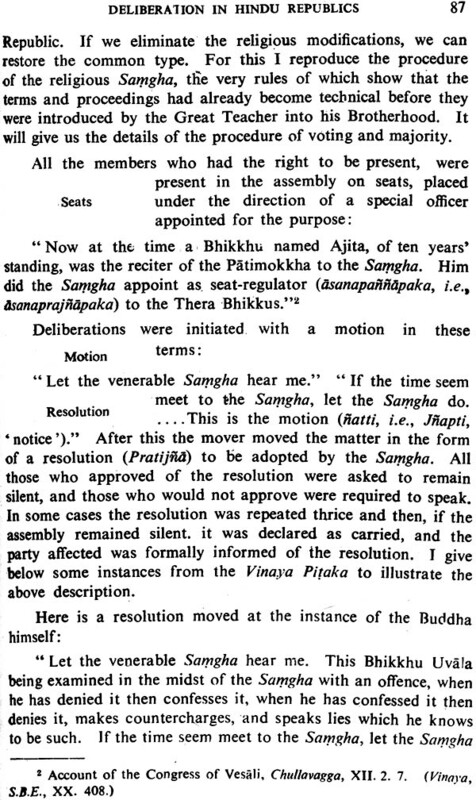 Buddhist Samgha based on political Samgha; Seats; Motion; Resolution; Quorum; Whip; Consequence of disregarding procedure; Votes: Votes of absentees; Ballot-voting; procedure-of-majority; Pointless Speeches and Delegation Committee; Principle of representation, Res Judicata; Procedure of Censure: Act of Indemnity; Clerks of the House; Historical significance of the terms and procedure; Jatakas and Referendum. Basis of Franchise; Outsiders eligible to Citizenship in republics; Bhakti to Arjuna and Vasudeva. Kulika Court; ,i>Samaya, the laws of the Ganas. Characteristics of Ganas in the Mahabharata; Leagues: their dangers; Good points in Ganas; Weak points in Ganas and how to avoid them; Internal danger; Equality in Ganas and its effect; Confederacy recommended. New Religious Ganas; Historical instances of new republics; Artificial Stage; Republican-a post-tribal period in India; Artificial political 'tribes' not ethnic tribes; Distinction between tribal and artificial organisations. 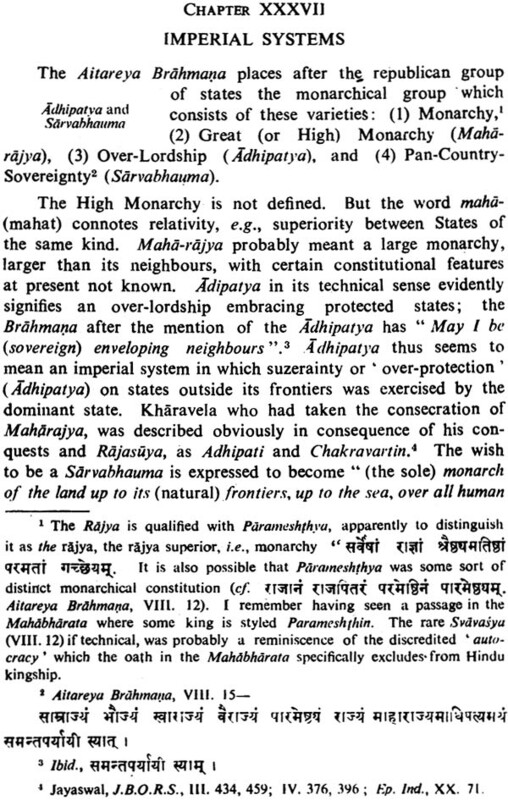 Policy of Maurya Imperialism towards Republics; Republics under Asoka; Meaning of 'aparanta'; 'Raja-vishayas'; Constitution of the Nabha-panktis; Nabhaka; Pulindas; Andhras; Yavanas of Asoka; Kabul Yavanas; Akoubhi; Yavanas, Kambojas, Andhras, and Pulindas in Manu and Mahabharata; Republican coins of the Maurya period; Addendum II on location of Hindu Republics in Asoka's Inscriptions. Migration of the stronger republics to Rajputana; yaudheyas; yaudheyas and Salankayanas; Yaudheya constitution from Monumental Records; Their end; Madras; Malavas and Kshudrakas; Malavas (contd. ); Sibis; Arjunayanas; The meaning of republican migration; Rajputana republics in the Mahabharata: Kukuras; Vrishnis; Foreign barbarians of the first century B.C. ; Decay of the older Punjab republics; Rajanyas; Maharaja-Janapada; Vamarathas and Salankayanas; Audumbaras; Nagas and Malavas; Other Republics. Guptas and republics; Pushyamitras; Exit; Addendum III on location of the Guptan Republics. Moral assets; Principle of equality. Successful administration; Military System; Industrial System; The type of citizen; Separation of powers; Philosophic basis; Republican theories; Individualism; Social Contract; Longevity; Weak points in Hindu Republics; Mahabharata on Arajaka states; Personal rivalry and greed of power in republics; Dissension leading to the breaking up of Ganas. 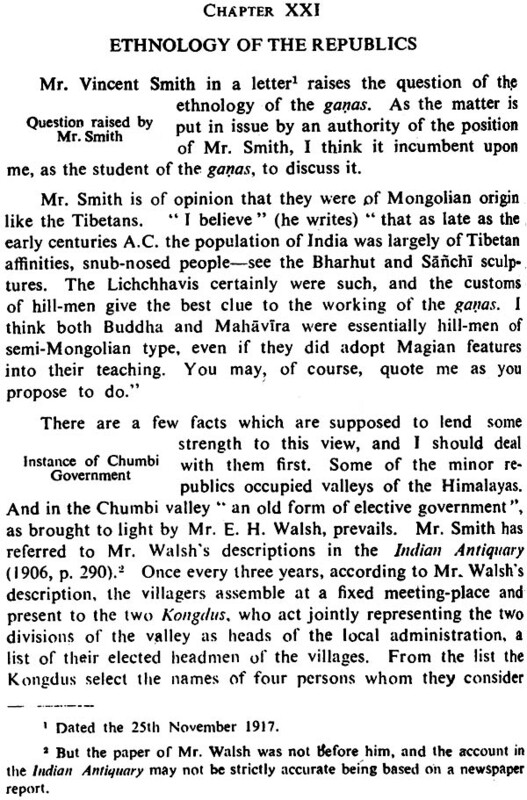 Question raised by Mr. Smith; Instance of Chumbi Government; Criticism; Bharhut and Sanchi Sculptors; Mr. Smith's error; Alleged Mongolian basis of Indian population in early centuries A.C. ; Nationality of Lichchhavis; Mr. Smith's vision-of 'close' resemblance between Lichchhavi and Tibetan Criminal Procedures; Lichchhavi Criminal Procedure; Derivation of Lichchhavi from Lichchhavin; Mallas; Nationality of Sakyas; Obsolete custom of sister-marriage amongst Sakyas; Evidence of the Greeks; Evidence of names and orthodox literature. Rajan or King: Antiquity of Hindu Monarchy; Hindu Theories on the Origin of Kingship; Vedic theory; origin in war; Scientists' Theory of Contract: Theory of elective kingship. King's election and his position; Sole taker of taxes; 'King-makers'; election for lifetime: Deposition and re-election; His duty: Germs of later political philosophy. Fixed Formulae; Rajasuya, Vajapeya and Sarvamedha; 'He' the king-elect; The Ratna-Havis; The Ratnins; Origin of Hindu Ministers; Approval of the Land; The idea underlying; Abhishechaniyam or anointing ceremonies; King as Protector of Law; Collection of waters; Abhishechana or Consecration; Investiture and Announcement. Coronation oath; Ascent to the throne; people as King's Protector; Besprinkling by the Priest; Brahmin and Taxation; Vesting of Sovereignty; Post-Abhisheka Ceremonies, Symbolism denoting Supremacy of Law; The Homage; The symbolic Game of Government; Summary; Hereditary succession not yet established; Ceremony for deposed king. 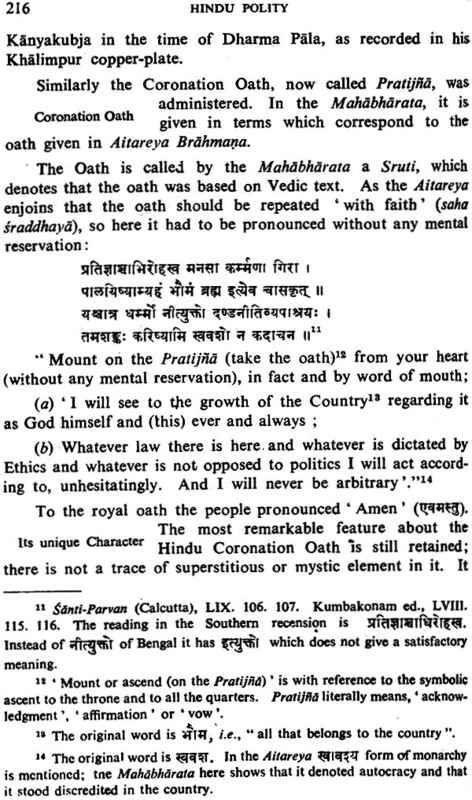 Leading Principle remains Vedic; Coronation Oath; Discussion on Rajan and 'history' of Coronation Oath in the Mahabharata; Analysis of the Oath; Effect of Coronation Oath in actual life; Coronation Oath in Middle Ages and later; Coronation and Elective Theory in later times; Age for Coronation; Observance of Coronations; law of Constitution. Sacrament of Coronation Oath; Manu's theory of Divine Origin of King; Theory of king's divine origin displaced. The Samiti and Territorial Monarchies; Rise of the Janapada Assembly; Janapada Seals; The Paura; Municipal administration of the Paura; The Paura administration of Pataliputra; The 'City-magistrates' of Strabo; 'Varga'; and its meaning; Naigama or the City Guild and its connextion with Paura; 'Negama coins'; Significance of Nigama. 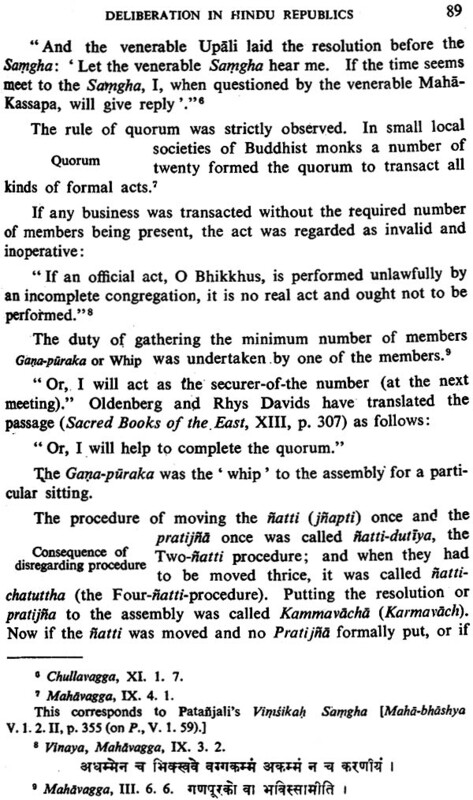 Coinage and Janapada: Constitutional business which the Paura-Janapada were supposed to do; Resolve on nomination of the Crown Prince; Paura-Janapada took part in Abhisheka as People's Representatives; They could prevent succession; Paura-Janapada and Depositions; Political Discussions in Paura-Janapada and Depositions; Appointment of Chief Mantrin and Paura-Janapada; Resolution on State Policy; Paura and Provincial Government; Agitation of the Paura of Taxila; Paura-Janapada and Taxation; Royal Speech to the Paura-Janapada; Paura-Janapada and Anugrahas; or Privileges; King asks permission of the Naigama Janapada to undertake long sacrifice; Daily business of Paura-Janapada with the King; Asoka's new Dharma and Janapada; Importance of Paura; Paura and executive work; King and governor attend Paura-Janapada; Paura-Janapada could make or mar Government; Compensation bills of Janapada to the Crown; Constituency of the Janapada; Composition of Paura; Separate bodies making up Naigama; Basarh Seals and Naigama Officers; The 'laws' of Janapada and Paura; The Samvid enactments of Janapada; Paura-Janapada as Hindu Diet. Opinion of Hermits and Recluses; Opinion of the learned Brahmin; Public Opinion in general. 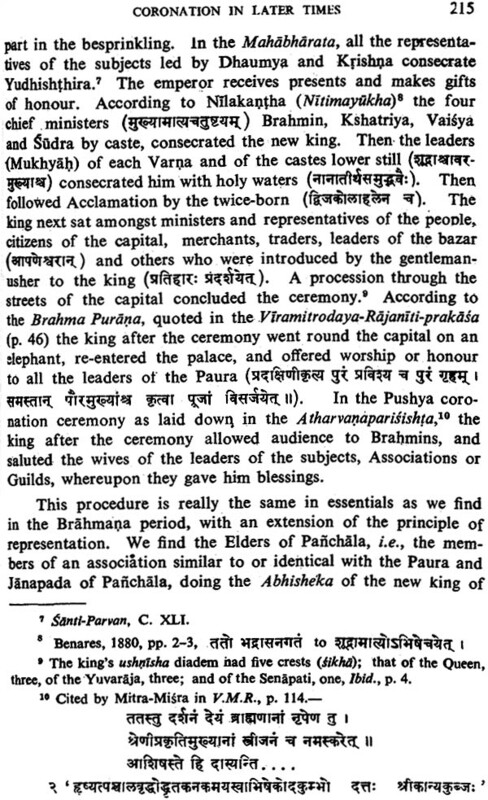 Origin; Continuation of Vedic term; Council and King; Gifts by King to be rectified or rejected by Ministry; Number of the members of the Council and the Cabinet; Yuvaraja and Princess as Ministers; Designation of Ministers; Cabinet; An Inner Cabinet; The 'Mantri-Parishad' or Council of State and its Composition; Paura-Janapada and 'Mantri-Parishad'; 'Tirthas'; Three classes of Ministers; Civil List and King's salary. 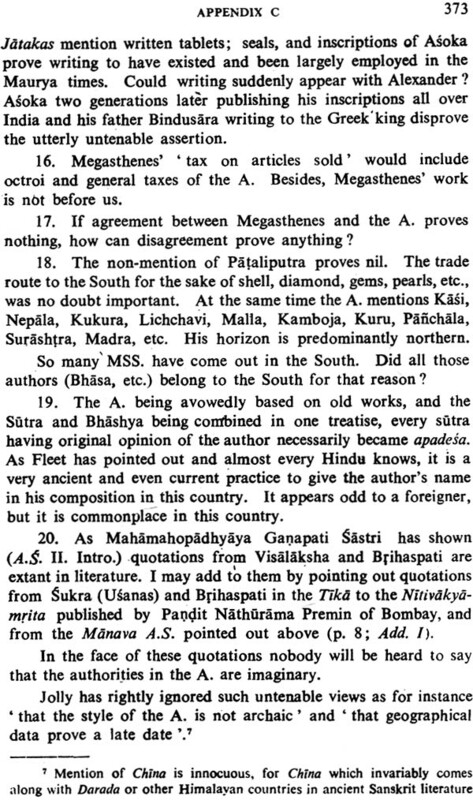 Duty of the Ministry; Procedure of Business in the Ministry; King's incapacity; to criticize resolution of the Ministry; Resolution with king's fiat was the 'real king'; Megasthenes on Ministry's jurisdiction; Agreement between Bharadvaja and Megasthenes; Working of the constitution in Asoka's reign; Junior ministers or under-secretaries; Transfers; Caste representation in Ministry; Official designations in Gupta times; Charters countersigned by Ministers; Illustrations of the practice from Ceylon. 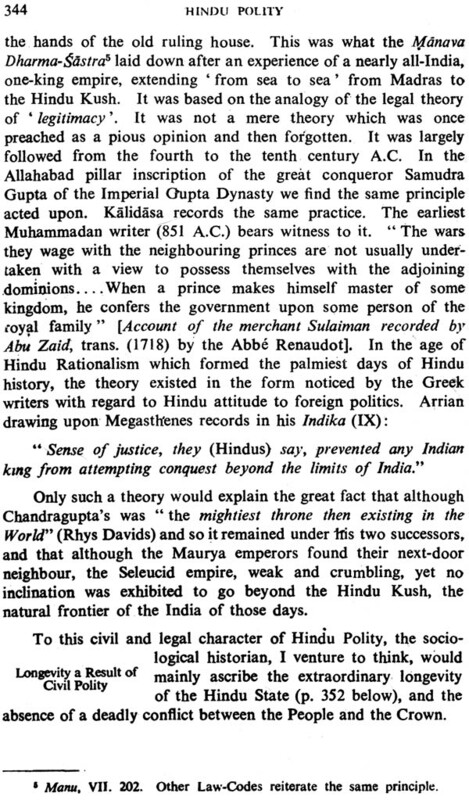 King under the Law; Judiciary and Executive separate; Sabha or composition of the jury; King-in-Council as Judge; Justice administered in King's name; Records kept; Proper Justice and fall in litigation; Sudatta vs. Prince Jeta; Ministers of Law and Justice; Sabha (Law Court) and its position. Fixed Taxes: Legal effect; Taxes as King's wages; Divine theory of Taxation; Protection and Allegiance; Canons of Taxation. Economic enemies; Economics in Government; policy towards the mercantile element of population; State Industries; Indirect taxation the key-note of the policy; Mines; Hindu theory on proprietorship in land; Colebrooke's discussion of Mimamsa; Conquest and land; Discussion by Prime Minister Madhva; The Bhattadipika on the subject: The view of Law and Mimamsa in agreement with constitutional theory; Jataka on kingship; Coronation rites and King's position; Inscriptions; Indianists' presentation of the 'Native Law' on the subject, Artha-Sastra Commentary's Sloka. Civil List; King master of no subject; King constitutionally a servant-morally master; His utility. State a trust; A Civil State; Paramount position of Law; Conquest and sense of Justice; Why on inclination for foreign conquest; Longevity a result of Civil Polity. Adhipatya and Sarvabhauma; Samrajya System; Later history of Monarchical Imperialism; Chakravartin; Chakravartin System vs. Federal System and Adhipatya; Centralization; An Imperial (Gupta) System of Compromise; Constitution under the Second and Third Empires. Period of darkness and disruption; Hindu revival under Sivaji and the Sikhs; Causes of failure. Longevity of Civil Polity-in India, Babylon and China; Test of a Polity; Golden Age of Hindu Polity-in the Future; Reformation of the Hindu; Hindu's Past History and his Future. Text and Translation of Santi-Parvan, Ch. 81; The importance of the discussion. 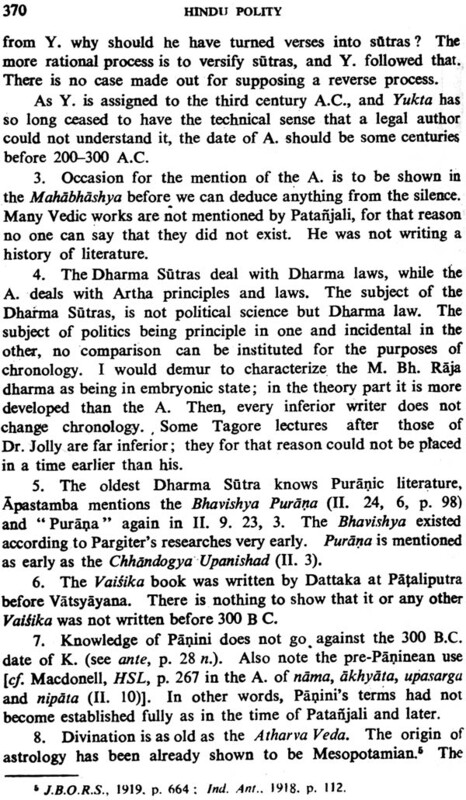 Arthasastra (Kautiliya)-Its authorship and Date; Authorship: Jolly's arguments; Date: Arguments for the third century A.C. Date; Works of the fourth-fifth century A.C.; and the date of the Kamandakiya; Pushkara; Fourteenth-Eighteenth Century Digests; Works in Vernaculars; Village tines; Na sa Sabha; Gana; State-arms of the republic; Decisions on rolls (Book of precedents); Ashta-kulaka; Lechchhavi; Savati-Jauhar; 'Everyman in the Community had franchise': Citizens vs. non-citizens; Kauninda and Kanet; Vahikan physique; Madra country; Salaka; Yaudheya Coin-legends; Malava coins; Freedom in preference to home; Sanakanikas; Ethnology of the republicans. Sresthin or President of the Town; Pratinidhi; Council of State; Representative of the People; Mahattarah and Gupta Government.